Bringing Up Baby (1938). starring Cary Grant and Katharine Hepburn, is one of the 1001 classic movies you should see. Each Monday, I'm going to recommend a classic movie you should see (for the reasons behind the 1001 series and reviews of earlier films covered go here). 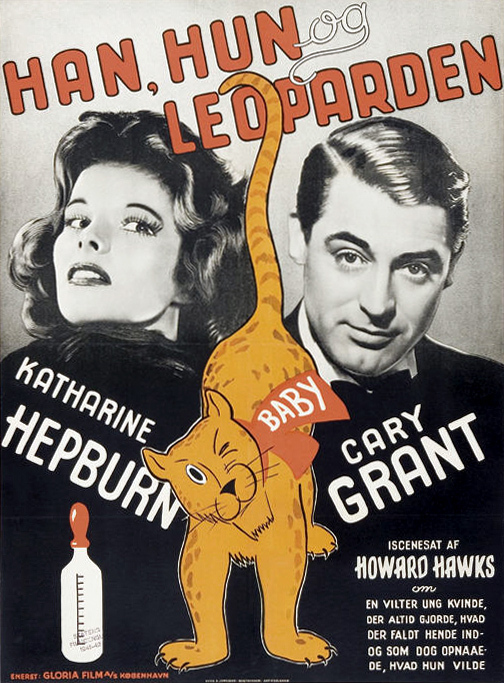 October's selections will focus on felines in film starting with Katharine Hepburn's pet leopard in the classic screwball comedy, Bringing Up Baby (1938). Bringing Up Baby follows the misadventures of David Huxley (Cary Grant), a mild-mannered paleontologist who has several well-laid plans for the future, including getting a million dollar donation to his museum from the wealthy Elizabeth Random (May Robson) and marrying a serious-minded young woman (Virginia Walker). David's plans fall to pieces when he meet's Random's free-spirited niece, Susan Vance (Hepburn), who proceeds to wreck his car, lose one of his precious dinosaur bones, and drag him all over the country while chasing a pet leopard. Director Howard Hawks was frustrated with a stalled screen version of Gunga Din for RKO Pictures (that movie would eventually be made by George Stevens) when he decided that he needed to work on a project that would make him laugh. Hawks remembered a short story by Hagar Wilde about an engaged couple with a runaway pet panther, and he decided that would be a perfect screwball comedy for Hepburn, who was RKO's leading female star. The result was a box-office disappointment that effectively ended Hepburn's career at RKO, although the film is now considered one of the great screwball comedies. 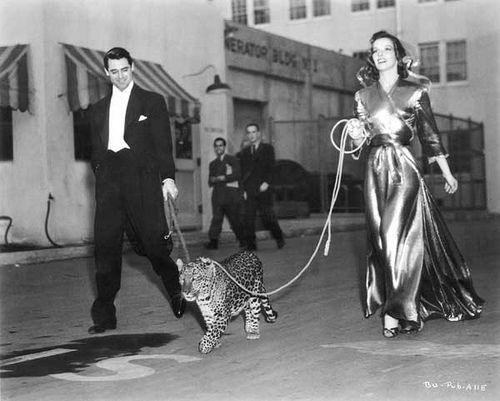 Hawks couldn't find a suitable panther for Bringing Up Baby, so he settled for a leopard named Nissa, who had already made several films with its trainer Olga Celeste. Grant was reportedly terrified of Nissa, but the fearless Hepburn got along well with animal (Nissa was fond of Hepburn's perfume). Still, Nissa's fussy feline temperament meant that Hawks had to use trick photography and rear-screen projection in many of the shots, which caused Bringing Up Baby to be behind schedule and over budget. 1. Box-office. Bringing Up Baby has gone down as one of the biggest flops in old Hollywood history, but that's not quite accurate. The movie did good business in urban areas like San Francisco and Washington D.C., but it sank like a stone in rural America. 2. Grant's performance. The notoriously fussy Grant claimed he couldn't understand the character of David, so Hawks told him to imitate the great silent comedian Harold Lloyd complete with a pair of look alike spectacles. 3. I Can't Give You Anything but Love, Baby. The jazz standard, which was written in 1928 by Jimmy McHugh and Dorothy Fields, is sung by Hepburn in her distinctive Yankee accent to soothe Baby. 4 Dialogue. In addition to hilarious physical comedy, Bringing Up Baby has lots of very funny dialogue. Grant's ad-libbed line, "I've just gone gay all of a sudden" while dressed in women's clothes is probably the best-remembered joke, but Hepburn also gets off a few good zingers, especially when, after breaking one of her high heels, she says, "I was born on the side of a hill." Cary Grant and Katharine Hepburn walk Nissa the leopard during the filming of Bringing Up Baby (1938). Other critics: Bringing Up Baby has a 95 percent fresh rating at Rotten Tomatoes and Leonard Maltin calls the movie "the definitive screwball comedy and one of the fastest, funniest movies ever made" in a four star review for his Classic Movie Guide. The film received mixed reviews from critics in 1938. The New York Times critic Frank S. Nugent hated it, especially Hepburn, writing that "In Bringing Up Baby, Miss Hepburn has a role which calls for her to be breathless, senseless and terribly, terribly fatiguing. She succeeds,and we can be callous enough to hint it is not entirely a matter of performance." Otis Ferguson from The New Republic was much more positive. "I am happy to report that it is funny from the word go," he wrote. 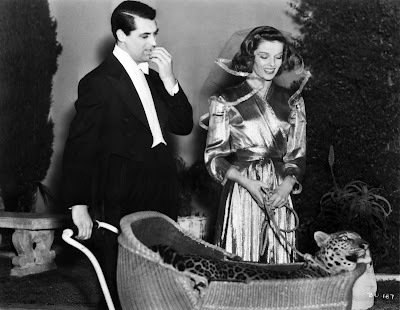 The bottom line: Bringing Up Baby is one of the masterpieces of American comedy. Watch it for the pure joy of two screen legends at the top of their game. Availability: Bringing Up Baby will air at 6 p.m. Oct. 9 on TCM. It is available on DVD and video on demand. Next week, I'll continue the theme of felines in film with Elizabeth Taylor's memorable performance as Maggie the Cat in Cat on a Hot Tin Roof (1958). I find more comedic joy in this film every time I watch it. Previously favourite bits are replaced by new favourite bits, and who know what I'll discover next time. So true. Bringing Up Baby never gets old. Love this movie! My second favourite film of all times actually! Thank you! It's a great honor!